Red Bull Asks Students: Can You Make It? Being dropped off in Europe with no money, no food and few possessions may sound like a nightmare, but 12 UT students are actually hoping for it. They are applying for Red Bull’s Can You Make It? competition, in which 165 teams of students will have seven days to make it to set locations across Europe, using only Red Bull as their money. When traveling across Europe, students must visit at least six checkpoints across the continent before reaching the final destination. Red Bull has not yet released information about where these checkpoints are. At the checkpoints, they will attempt to complete challenges. If they complete a challenge, they are rewarded with more cans of Red Bull. “It seemed like a great team building opportunity with the new members of the club,” Outeiral said. Students had to fill out a brief application online and make a video with their chosen team members. 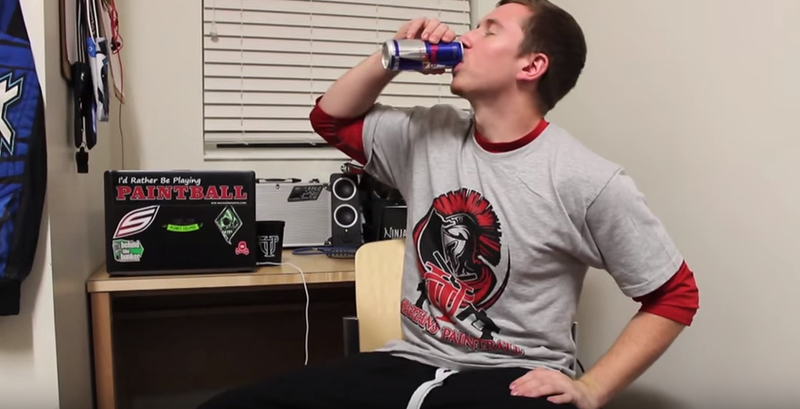 The Spartan Paintball Club’s audition video on YouTube features shots of them playing paintball, high-energy images of UT, and of course, cans of Red Bull. “I think if we all put our heads together we would win this challenge and have a great time doing it,” said Piskorz, a freshman sports management major, in the group’s audition video. The team videos are currently subject to a public vote. Judges will select the teams from the ones with the most votes, and these selected teams will be flown to Europe. At the end of the seven days, one winning team will be invited to be Contiki Travel Ambassadors for the summer, which means that they will get to travel around Europe seeing attractions for the rest of the summer. Piskorz believes that he has skills that will benefit his team should they make the cut. “I’ve been told that I’ve had great people skills; so being able to talk with people and convince them to exchange food or shelter for Red Bull would be something I would love to do,” Piskorz said. A film crew will be following the teams as they compete, and the footage will be posted on Red Bull TV, an online streaming service of sports and inspirational videos. Red Bull hopes the challenge will leave students with valuable skills. Click here and type University of Tampa in the search bar to vote.